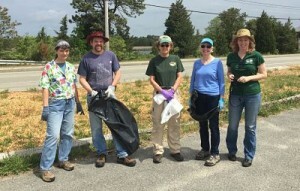 The Wareham Land Trust has joined with local community organizations and residents to clean up our town! Please join us on Sunday, May 31st at 11:00 a.m. at our Bryant Farm property near Nessralla’s Farm Stand and the driving range on Route 6. Bring a garbage bag, gloves, bug spray, and a smile. Together we can all make our town and even more beautiful place! Rain or shine. Any questions, call Kathy at 508-295-5564. Update: Thanks to everyone who helped this morning!